For other uses of "Volkhov", see Volkhov (disambiguation). Volkhov River near Veliky Novgorod, and the Yuriev Monastery. The Volkhov (Russian: Во́лхов) is a river in Novgorodsky and Chudovsky Districts of Novgorod Oblast and Kirishsky and Volkhovsky Districts of Leningrad Oblast in northwestern Russia. It connects Lake Ilmen and Lake Ladoga and belongs to the basin of the Neva River. The length of the river is 224 kilometres (139 mi), and the area of its drainage basin is 80,200 square kilometres (31,000 sq mi). The city of Veliky Novgorod, the towns of Kirishi, Volkhov and Novaya Ladoga, and a historically important village of Staraya Ladoga are located along the Volkhov. A number of etymologies, none universally accepted, have been proposed for the name of the river. In his Etymological dictionary of the Russian language, Max Vasmer doubted some philologists' opinion that the river's name is related to the Finnish velho ("magician") or Russian volkhv ("pagan priest"). The Volkhov flows out of Lake Ilmen north into Lake Ladoga, the largest lake of Europe. It is the second largest tributary of Lake Ladoga. It is navigable over its whole length. Discharge is highly variable depending primarily on the level of Lake Ilmen. The Volkhov is reported to reverse the direction of its flow in its upper section in exceptional circumstances. The river freezes up in late November, and breaks up in early April. The level of water is regulated by the dam of the Volkhov hydroelectric plant (the first Soviet regional hydroelectric dam opened on December 19, 1926 in the framework of the GOELRO plan) situated 25 km upstream from the mouth of the river. Apart from hydroelectric generating purposes, the dam serves to facilitate navigation in the lower part of the river previously known for its rapids. The upstream part of the Volkhov is connected to the Msta River by the Siversov Canal bypassing Lake Ilmen. The downstream part is connected with the Neva, the Syas River, and the Svir River by the New Ladoga Canal bypassing Lake Ladoga. The main tributaries are of the Volkhov are the Vishera (right), joins the Maly Volkhovets armlet; the Kerest (left); the Oskuya (right); the Pchyozhva (right); the Tigoda (left); the Chyornaya (right); the Vloya (left); the Olomna (left). The drainage basin of the Volkhov includes the large parts of Novgorod and Leningrad Oblasts, as well as areas in Tver Oblast, Pskov Oblast of Russia and Vitebsk Oblast of Belarus. The main rivers belonging to the river basin of the Volkhov are the Msta, the Lovat, the Pola, and the Shelon. Despite its relatively small size, Volkhov has played a large role in Russian history and economy: in recognition of that, a figure representing the Volkhov appears among the allegorical monuments to the four major rivers of Russia (the others are: Volga, Dnieper and Neva) on the rostral columns in the ensemble of the Old Saint Petersburg Stock Exchange and Rostral Columns. Its role in facilitating trade is due to its position as the only river penetrating deep into inland Russia that flows north towards the Baltic, rather than south towards the Caspian or Black Seas. 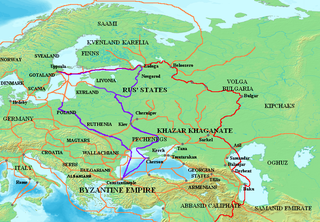 In the mid-9th century, the Volkhov was a heavily populated trade artery of the Varangian-dominated Rus' Khaganate. It was a vital part of the most important trade route connecting Northern Europe to the Orient, by way of the Volga (Volga trade route) and Dnieper (trade route from the Varangians to the Greeks). The ancient Russian capital Staraya Ladoga and one of the most significant Russian medieval cities Velikiy Novgorod are located along the Volkhov. After entering the Volkhov near Gorchakovshchina and Lyubsha, commercial vessels of the Vikings cast anchor at the major trade emporium of Aldeigja (Ladoga). Then they rowed upstream past a series of rapids, guarded by the fortified settlements at Novye Duboviki and Gorodishche. There was another outpost at Kholopy Gorodok, 13 km north of present-day Velikiy Novgorod, or rather Holmgard, which was founded near the point where the Volkhov flows from Lake Ilmen. "Most of these were initially small sites, probably not much more than stations for re-fitting and resupply, providing an opportunity for exchange and the redistribution of items passing along the river and caravan routes". It seems on the whole likely that such pre-urban settlements gave the country its Norse name of Gardariki. During World War II, the stretch of the Volkhov north of Veliky Novgorod separated Soviet (right bank) and German (left bank) troops between 1941 and 1944. German soldiers built extensive "underground cities" along the battlefront. Local birch was used for constructing shelters and hundreds of miles of corduroy road in the swampland. Buildings were on slopes to allow for drainage. "Six or eight men occupy each hut and there are also underground stables and storage places for coal and supplies." The entire Volkhov River is navigable; however, there is no passenger navigation. As with other navigable rivers, the navigability of the Volkhov makes it possible to transport bulky pieces of equipment which are inconvenient to ship by rail or road due to their size. In 2015, the Volkhov was part of a route of a river barge transporting a VVER-1200 nuclear reactor vessel from the Atommash plant in Volgodonsk. After being moved by the barge up the Volkhov to Novgorod, the reactor was taken across the city to the train station, and then shipped by a special rail car to Belarus. Wikimedia Commons has media related to Volkhov River. ^ Фасмер, Макс. Этимологический словарь Фасмера (in Russian). p. 111. ^ A Comparative Study of Thirty City-state Cultures (ed. by Mogens Herman Hansen). Kgl. Danske Videnskabernes Selskab, 2000. Page 266. ^ "Underground Cities in Russia." Command and General Staff School Military Review: Monthly Review of Military Literature. May 1943. Volume XXIII (2). Page 44. Russia can be divided into a European and an Asian part. The dividing line is generally considered to be the Ural Mountains and the Caspian Sea. The European part is drained into the Arctic Ocean, Baltic Sea, Black Sea, and Caspian Sea. The Asian part is drained into the Arctic Ocean and the Pacific Ocean. Staraya Ladoga ; Finnish: Vanha Laatokka; Old Norse: Aldeigjuborg) is a rural locality in Volkhovsky District of Leningrad Oblast, Russia, located on the Volkhov River near Lake Ladoga, 8 kilometers (5.0 mi) north of the town of Volkhov, the administrative center of the district. The Northern Dvina is a river in northern Russia flowing through the Vologda Oblast and Arkhangelsk Oblast into the Dvina Bay of the White Sea. Along with the Pechora River to the east, it drains most of Northwest Russia into the Arctic Ocean. It should not be confused with Western Dvina. Leningrad Oblast is a federal subject of Russia. It was established on August 1, 1927, although it was not until 1946 that the oblast's borders had been mostly settled in their present position. The oblast was named after the city of Leningrad. Unlike the city, the oblast retains the name of Leningrad. The Novgorod Slavs or Ilmen Slavs were the northernmost tribe of the Early East Slavs, which inhabited the shores of Lake Ilmen and the basin of the rivers of Volkhov, Lovat, Msta, and the upper stream of the Mologa River in the 8th to 10th centuries. Lake Ilmen is a large lake in the Novgorod Oblast of Russia. It's a historically important lake, which formed a vital part of the trade route from the Varangians to the Greeks. The city of Novgorod - which is a major trade center of the route - lies six kilometers below the lake's outflow. The Valdai Hills are an upland region in the north-west of central Russia running north-south, about midway between Saint Petersburg and Moscow, spanning Leningrad, Novgorod, Tver, Pskov, and Smolensk Oblasts. The Msta is a river in Vyshnevolotsky, Udomelsky, and Bologovsky Districts of Tver Oblast and in Borovichsky, Okulovsky, Lyubytinsky, Malovishersky, Krestetsky, and Novgorodsky Districts, as well as in the town of Borovichi of Novgorod Oblast of Russia. It is a tributary of Lake Ilmen. It is 445 kilometres (277 mi) long, and the area of its basin 23,300 square kilometres (9,000 sq mi). The principal tributaries of the Msta are the Berezayka (left), the Uver (right), and the Kholova (left). The town of Borovichi and the urban-type settlement of Lyubytino are located on the banks of the Msta. The Lovat is a river in Vitebsk Oblast of Belarus, Usvyatsky, Velikoluksky, and Loknyansky Districts, as well as of the city of Velikiye Luki, of Pskov Oblast and Kholmsky, Poddorsky, Starorussky, and Parfinsky Districts of Novgorod Oblast in Russia. The source of the Lovat is Lake Lovatets in northeastern Belarus, and the Lovat is a tributary of Lake Ilmen. Its main tributaries are the Loknya (left), the Kunya (right), the Polist (left), the Redya (left), and the Robya (right) Rivers. The towns of Velikiye Luki and Kholm, as well as the urban-type settlement of Parfino, are located on the banks of the Lovat. The Pola is a river in Andreapolsky and Penovsky Districts of Tver Oblast and in Maryovsky, Demyansky, and Parfinsky Districts of Novgorod Oblast of Russia. It is a tributary of Lake Ilmen. It is 267 kilometres (166 mi) long, and the area of its basin 74,200 square kilometres (28,600 sq mi). The principal tributaries of the Pola are the Maryovka, the Kamenka, the Yavon, and the Polomet, all from the right. The Maly Volkhovets is a right (eastern) armlet of the Volkhov River in Novgorodsky District of Novgorod Oblast in Russia. It splits from the Volkhov 2 kilometres (1.2 mi) below its outflow from the Lake Ilmen, bypasses the city of Veliky Novgorod, and rejoins the Volkhov north of the Khutyn Monastery. It is 17 kilometres (11 mi) long. The Vishera River, one of the Volkhov's principal tributaries, is a tributary of the Maly Volkhovets. The administrative division of Novgorod Republic is not definitely known; the country was divided into several tysyachas and volosts. The city of Novgorod with its vicinity, as well as a few other towns were not part of any of those. Pskov achieved an autonomy from Novgorod in the 13th century; its independence was confirmed by the Treaty of Bolotovo in 1348. After the fall of the republic, Novgorod Land, as part of Russia, consisted of 5 pyatinas that were further divided into uyezds and pogosts. This division was replaced only in the beginning of 18th century when Peter I introduced guberniyas. Volkhovsky District is an administrative and municipal district (raion), one of the seventeen in Leningrad Oblast, Russia. It is located in the central eastern part of the oblast and borders with Lodeynopolsky District in the northeast, Tikhvinsky District in the southeast, Kirishsky District in the south, and with Kirovsky District in the west. In the north, it is washed by Lake Ladoga. The area of the district is 5,124.4 square kilometers (1,978.5 sq mi). Its administrative center is the town of Volkhov. Population : 48,000 (2010 Census); 50,799 ; 58,939 (1989 Census). Novgorodsky District is an administrative and municipal district (raion), one of the twenty-one in Novgorod Oblast, Russia. It is located in the southwest of the oblast and borders with Tosnensky District of Leningrad Oblast in the north, Chudovsky District in the northeast, Malovishersky District in the east, Krestetsky District in the southeast, Shimsky District in the southwest, Batetsky District in the west, and with Luzhsky District of Leningrad Oblast in the northwest. In the south, the district is limited by Lake Ilmen. The area of the district is 4,600 square kilometers (1,800 sq mi). Its administrative center is the city of Veliky Novgorod. Population: 57,673 (2010 Census); 58,622 ; 55,491 (1989 Census). In terms of both area and population, this is the largest district in Novgorod Oblast. Assumption Cathedral, also Dormition Cathedral in the selo of Staraya Ladoga, Volkhovsky District, Leningrad Oblast, Russia is one of the oldest churches of Russia, dating from the second half of the 12th century. It is one of the few surviving pre-Mongol buildings in Russia, and the northernmost one. The cathedral is the katholikon of the female Assumption Monastery, one of the several monasteries in Staraya Ladoga, and is located on the left bank of the Volkhov River. The building was designated an architectural monument of federal significance (#4710028015).